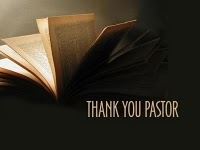 Pastor Appreciation Month gets more coverage (and consequently pastors get more encouragement) south of the border but...our shepherds need to know they are appreciated. Here's another poem from the pen of my friend Greg. Now let's act on what we've read. Your local Christian bookstore (Emmaus Family Books in Peterborough) has some excellent cards. Drop in and pay Jim Rose a visit. Live in the Cobourg area? Drop by and pay Paul Wilkinson a visit at the Searchlight Bookstore. No need to visit Hallmark even though I love their products. so all the bills are paid. Quit shopping for another church. in hopes of finding "Willow Creek." 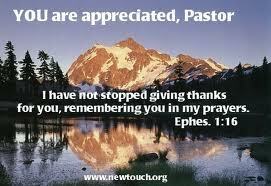 Pray daily for our kids and wife. that cloud our faith with fear. the greeters, teachers, those who "ush"
and those who "baby watch." the things some do you think unwise. Give grace to those who fail "your test"
and take stock of your pride. In all these ways your love's expressed.